Here’s a drinking game. 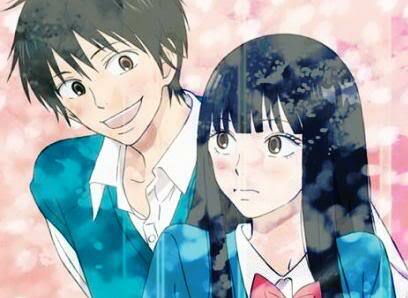 Marathon Kimi Ni Todoke. Everytime Sawako cries or says ‘I’m so happy’, take a shot. Get super drunk. Summery: Sawako is shy, sweet, good natured girl. Sawako has the unfortunate curse with looking at the character Sadako from The Ring, scaring her classmates. However, her classmate Kazehaya sees right through it, and tries to pull her out of shell, prove that she’s not scary and along the way, make some friends. Why I Picked It Up: I like shoujo stories, and I heard this was suppose to be a really good manga. Why I Finished It: I’m not entirely sure. This series never really grabbed me. At one point, I had to marathon eight episodes. It never got bad enough for me to drop, but I never got into it either. I did like Chizu and Yano, and the arch between Chizu and Ryuu was amazing. The ending was sweet. But aside from that, it didn’t really appeal to me. But: For me, there are a lot of buts. I didn’t like Sawako or Kazehaya, I thought the plots in the first 2/3 were boring, clichéd, and moved way too slow. It was completely unrealistic, to have a girl go from suddenly an outcast to liked by her classmate. It wish-fulfillment for any girl having to deal with the suckage that is middle school and high school, plain and simple, that a prince charming will appear out of nowhere and make everything all better. Maybe it’s my personal resentment dealing with middle and high school. It’s also, while all shoujo is wish fulfillment, there’s so many shoujo manga out there not getting an anime that I’d love to see, while Kimi Ni Todoke, one of the shallower shoujo stories out there, gets an adaptation. Who Would I Give This To: Any girl looking to escape the hell that is high school or especially middle school. I wasn’t impressed either. It started off cute, but went downhill fast. A heartwarming moment of two can’t save a series from itself, though a lot of people were obviously starved for that sort of thing this season – they’re even willing to forgive this show it’s major flaws. Myself, I’m hard-pressed to remember a more uninspiring highschool romance anime (and I’ve suffered through quite a few bad ones). I’m glad I wasn’t the only one not impressed.